Amazon data for the series I was tracking in May is here. It’s largely unremarkable; only 4 series spent prolonged periods of time ranking in the quadruple digits, and 3 (Yugioh, Fairy Tail, and DBZ) were long runners. More interestingly, Attack on Titan started soliciting this week. If my calculations are correct, it has a very real chance of snagging a spot on the BD charts in the US, becoming the first anime release to do so since I began tracking series this February. Note: While what follows is based on data I have gathered, it is largely speculative and makes a number of assumptions, among them that amazon performance is indicative of the BD/disk market in the US and that anime does not perform significantly differently from other types of titles in similar places in these rankings. These may well be way, way off, so take it with a heavy dose of skepticism. 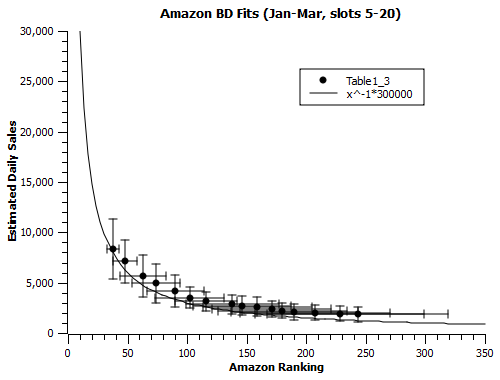 It’s a basic inverse power law: Sales=300,000/Daily Amazon Rank. I tested this law against the two big thresholds I had previously garnered. At the low-end Aria limit of 120,000th place, it gives 2.5 volumes sold per day, which is at least close to the 1 or less we expect. At the high-end Berserk limit, it predicts a first week sale (including preorders) of about 6500 sales, that’s less than the ~10k-15k threshold we would expect it to be below, so we’re (very tentatively) in business. Based on the data I’ve collected thus far, which goes up to June 4th, the series, including limited edition sales, has sold a little over 16,400 copies (via 15,200 RE sales and 1200 LE sales, including preorders for each). There are still 4 more days left in the week that will end on June 8th (i.e. the relevant tracking period), and how the series will end up ranking will depend on how well it does over those next several days. If it spends them in 100th place, roughly where it is now, it’ll add about 12,000 copies (Note: the series is ranked 109th as of this reading). If it spends them in 200th place, it’ll add about 6000 copies. If it drops relatively quickly, to 300th place, it’ll only add about 4000 copies. Even in a worst case scenario where it drops to 1000th tomorrow, it’ll still add about 1200 additional copies. That’s enough to get it up above 17,500 disks sold, above the highest post-January thresholds. If the assumptions I’ve made aren’t wrong, the series should chart. Different degrees of optimism peg its exact figure at between 17,000 and 29,000 copies sold. I’m not holding my breath or saying anything’s for certain, but I’ll be very interested in looking at the BD charts for this current week when they become available. This entry was posted in Articles, Fun With Numbers and tagged Anime, Attack on Titan, Fun With Numbers by torisunanohokori. Bookmark the permalink. Someanithing has a solid idea of exactly how many points STALKER give at each ranking. If you haven’t yet, you should consult him about it. This is looking really promising! So there should be some storefront presence for big titles, at least. Might help skew the model a bit in favor of highly ranked titles. I’m currently looking into just buying a videoscan membership for a short period just to check those lists and be done with it. If I can’t get figures for this one, I might finish tracking at some point; I’ve got a general idea of what does well, but there’s a limit to how useful the models can be when they can’t be tested against anything but rough caps. Correction, Home Media magazine just doesn’t seem to count anime. I know this because their BD top 20 is missing a certain DBZ s3 that The Numbers just posted sold about 7472 copies. It’s possible Berserk’s third movie was able to chart after all.